See Table 1 in Florida’s Established Arthropod Weed Biological Control Agents and Their Targets (2013) for a list of arthropod biological control agents that occur on this species. Hydrilla is a submersed plant. It can grow to the surface and form dense mats. It may be found in all types of water bodies. Hydrilla stems are slender, branched and up to 25 feet long. Hydrilla’s small leaves are strap-like and pointed. They grow in whorls of four to eight around the stem. The leaf margins are distinctly saw-toothed. Hydrilla often has one or more sharp teeth along the length of the leaf mid-rib. Hydrilla produces tiny white flowers on long stalks. It also produces 1/4 inch turions at the leaf axils and potato-like tubers attached to the roots in the mud. Hydrilla is a herbaceous perennial. Submersed, “obligate” (requiring a wet habitat). Forming dense stands of very long stems (25 ft.) in the water. Reproduces mainly by regrowth of stem fragments; also reproduces by growth of axillary buds(turions) and subterranean tubers; tubers can remain viable for more than 4 years (Van & Steward 1990). A single tuber can grow to produce more than 6,000 new tubers per m2 (Sutton et al. 1992). Hydrilla can grow in almost any freshwater: springs, lakes, marshes, ditches, rivers, tidal zones. Can grow in only a few inches of water, or in water more than 20 feet deep. Can grow in oligotrophic (low nutrient) to eutrophic (high nutrient) conditions. Can grow in 7% salinity of seawater (Haller 1974). Temperature tolerance: hydrilla is somewhat winter-hardy; its optimum growth temperature, 20-27o C (68-81o F); its maximum temperature, 30o C (86o F) (Kasselmann 1995). U.S. southern populations overwinter as perennials; northern populations overwinter and regrow from tubers. Can grow in only 1% of full sunlight. Low light compensation and saturation points and low CO2 compensation point make it a competitive plant because it can start growing in low light before other plants do (Van et al. 1976; Bowes 1977). Rooted in the hydro-soil, adventitious roots are white. The plant is submersed, except when branches have reached and grown across the water surface; sometimes found as detached floating mats. Appearance can vary substantially, depending on growth conditions (Pieterse et al. 1985). Stems submersed, slender (about 1/32 in. thick) and sinewy, long (to 25 feet). Profuse branching occurs near the water surface. Leaves small (5/8 in. long), strap-like, pointed tips, conspicuous midrib; arranged in whorls of 4 to 8, joined directly to the stem, whorl internodes 1/8 to 2 in. long. Leaf margins distinctly visible saw-toothed; often with one or more sharp teeth along the underside midrib. Leaf color green; clean leaves are transluscent; topped out leaves, bleached by the sun and attacked by fungus and bacteria, may appear yellowish to brownish-green. opens to form a wide funnel into the water; petal rims hold flower to surface and prevent water from getting into flower; female petals 6, to 1/16 in. long; stamens 3, styles 3, stigmas 3. Turions (“buds” in some of the leaf axils), are dark green, cylindrical, to 1/4 in. round, occasional. Subterranean turions (“tubers”), are yellowish, potato-like, attached to the root tips in the hydrosoil, to 1/2 in. long, 1/2 inch broad. Hydrilla verticillata might be confused with at least two other submersed, long-stemmed plants having small narrow leaves (e.g., Elodea canadensis and Egeria densa). There is only one species of Hydrilla in the world. Hydrilla verticillata’s dioecious type (plants having female flowers only) originates from southern India. Hydrilla’s monoecious type (plants having male and female flowers on the same plant) is probably from Korea. (Madeira et al. 1997). Occurs in Europe, Asia, Australia and the Pacific, Africa, South America and North America. Hydrilla verticillata is present from Florida to Connecticut and west to California and Washington. Its dioecious form is mainly in the southern U.S.; north of South Carolina hydrilla is mainly monoecious. drainage maps show precisely where the plants are, making it easier for managers to infer where the plants might go next, and thus where to take preventive measures. introduced separately much later in the Potomac Basin (Enrionmental Laboratory 1985). Hydrilla spreads to new waters mainly as fragments on boats and trailers. In Russia, hydrilla grows to 50o N latitude–equivalent to the US/Canadian border. mats, or are simply outcompeted, and eliminated (van Dijk 1985). Hydrilla verticillata greatly slows water flow and clogs irrigation and flood-control canals; in Florida, large mats of fragments collect at culverts and clog essential water control pumping stations. Hydrilla seriously interferes with boating, both recreational and commercial, and prevents swimming and fishing; major infestations limit sportfish weight and size (Colle & Shireman 1980). Dense hydrilla infestations can alter water chemistry and oxygen levels (Pesacreta 1988). In some cases, lake drawdowns may help manage hydrilla by letting the exposed plants die and decompose. plants and may actually increase the plant’s distribution. including tuber-feeding weevils and leaf-eating flies. Registered aquatic herbicides do provide temporary control of hydrilla. From the University of Florida Aquatic Weed Management Guide, Vandiver 1999. According to this Guide, … copper, diquat, endothall and fluridone; As always, comply with federal law by following the herbicide label instructions, permissible sites and application rates. Is “state-listed” in Arizona, Arkansas, California, Florida, New Hampshire, North Carolina, Oregon, Puerto Rico, South Carolina, Arkansas, California and Washington. Is on the Federal List of Noxious Weeds (USDA/APHIS, 2000). about its natural ecology. Thousands of research articles may have been published about one invasive plant, but perhaps only a dozen about another. citations and their content keywords. Or you might want to ask us to do it for you and mail or e-mail the search results to you. Hydrilla is not native to Florida. Hydrilla is a submersed, exotic plant introduced to this country only 40 years ago. Hydrilla causes significant environmental and economic problems in Florida and elsewhere. Its long stems often grow to the surface to form large, dense infestations that crowd out and replace native aquatic plants. Hydrilla may be found in all types of waterbodies throughout the state. This plant grows either rooted or as pieces drifting in the water. Its stems are slender, branched, and up to 25 feet long. Hydrilla’s small leaves are straplike and pointed. They grow in whorls of 4 to 8 around the stem. The easiest way to recognize hydrilla is to look at the leaf margins and leaf undersides. The leaf margins are distinctly saw-toothed. Turn the leaf over, to see the midrib. The midrib is the large, main vein in the middle of the leaf. Hydrilla often has 1 or more sharp teeth along the length of the leaf midrib. These tiny teeth make hydrilla feel rough when pulled through the hand. In Florida, hydrilla produces female flowers. These very tiny, white flowers are only about an eighth of an inch across. They float on the water surface, attached to the plant by long stalks. Male hydrilla has not been introduced to Florida. Therefore, its male flowers are not observed here. Hydrilla also produces turions and tubers from which new plants can sprout. Turions are quarter-inch, greenish, budlike structures that grow at the leaf axles. Tubers are potato-like and about one-half inch long. They grow in the mud, attached to the ends of underground stems. Hydrilla can be confused with another exotic aquatic plant in Florida, egeria. Please see Segment 9 about egeria, a common water weed, to learn the differences between these similar plants. Remember, exotic hydrilla has long, slender stems. The leaves grow in whorls about the stem. The leaves have obvious saw-tooth margins; and on the underside of the leaf, one or more teeth may be on the midrib. Hydrilla produces tubers and turions. View the booklet: Hydrilla verticillata: The Perfect Aquatic Weed. Download the Recognition Card of Hydrilla verticillata (PDF 1.3 MB). Hydrilla in Lake Izabal, Guatemala – Current Status and Future Prospects, by W.T. Haller – 2002 (PDF 1.2 MB). See more images and information about hydrilla, as contained in the book, Identification & Biology of Non-Native Plants in Florida’s Natural Areas. Here is the PDF file of Hydrilla Management in Florida: A Summary and Discussion of Issues Identified by Professionals with Future Management Recommendations Final Document: 2005. This is the literature about Hydrilla verticillata that was used to develop this web page. More research items about this plant may be found at APIRS. Bsiouny FM, Haller WT, Garrard LA. 1978. Survival of hydrilla(Hydrilla verticillata) plants and propagules after removal from the aquatic habitat. Weed Sci. 26:502-504. Blackburn RD, Weldon LW, Yeo RR, Taylor TM. 1969. Identification and distribution of certain similar-appearing submersed aquatic weeds in Florida. Hyacinth Control J. 8:17-23. Bowes G, Holaday AS, Van TK, Haller WT. 1977. Photosynthetic and photorespiratory carbon metabolism in aquatic plants. In Proceedings 4th Int. Congress of Photosynthesis, Reading (UK). pp. 289-298. Cassani JR. 1996. Managing aquatic vegetation with grass garp. A guide for water resource managers. American Fisheries Soc., Introduced Fish Sect., Bethesda, MD., 196 pp. Colle DE, Shireman JV. 1980. Coefficients of condition for largemouth bass, bluegill and redear sunfish in hydrilla-infested lakes. Transactions of the American Fisheries Society 109:521-531. Cook CDK, Lund RL. 1982. A revision of the genus Hydrilla (Hydrocharitaceae). Aquat. Bot. 13:485-504. Environmental Laboratory, Army Corps of Engineers. 1985. Monoecious Hydrilla in the Potomac River. Miscellaneous Paper MP A-85-5. US Army Engineer Waterways Experiment Station, Vicksburg, MS.
Haller WT, Miller JL, Garrard LA. 1976. Seasonal production and germination of hydrilla vegetative propagules. J. Aquat. Plant Manage. 14:26-29. Haller WT, Sutton DL, Barlowe WC. 1974. Effects of salinity on growth of several aquatic macrophytes. Ecology 55($):891-894. Madeira P, Van T, Steward K, Schnell R. 1997. Random amplified polymorphic DNA analysis of the phenetic relationships among world-wide accessions of Hydrilla verticillata. Aquatic Botany 59:217-236. McCann JA et al. 1996. Nonindigenous aquatic and selected terrestrial species of Florida-Status, pathway, and time of introduction, present distribution, and significant ecological and economic effects. Southeastern Biological Science Center, Gainesville, 256 pp. Pesacreta G. 1988. Water Chemistry from North Carolina Piedmont Impoundments with Hydrilla (Hydrilla verticillata (L.f.) Royle). Ph.D. dissertation, North Carolina State University, Raleigh. Pieterse AH. 1981. Hydrilla verticillata – a review. Abstr. Trop. Agric. 7:9-34. Salvucci ME, Bowes G. 1983. Two photosynthetic mechanisms mediating the low potorespiratory state in submersed aquatic angiosperms. Plant Physiol. 73:488-496. Spencer DF, Anderson LWJ. 1986. Photoperiod responses in monoecious and dioecious Hydrilla verticillata. Weed Sci. 34:551-557. Steward KK, Van TK. 1987. 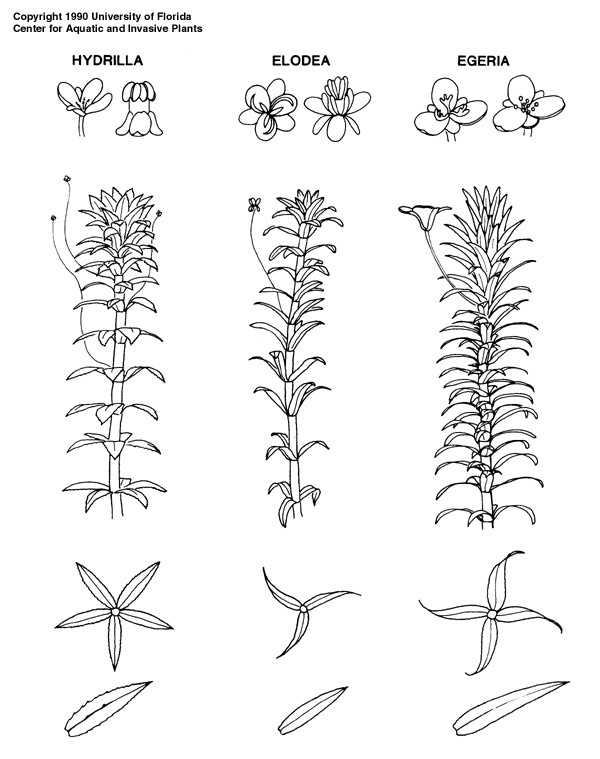 Comparative studies of monoecious and dioecious hydrilla (Hydrilla verticillata) biotypes. Weed Sci. 35:204-210. Stocker RK. 1996. Control technologies for use against the submersed aquatic weeds hydrilla and hygrophila. Semi-Annual Rept., USDA/ARS-IFAS, Gainesville, FL, 68 pp. Van TK, Haller WT, Bowes G. 1976. Comparison of the photosynthetic characteristics of three submersed aquatic plants. Plant Physiol. 58:761-768. Van TK, Steward KK. 1982. Evaluation of chemicals for aquatic plant control. Annual Report 1981, Ft. Lauderdale, FL, 66 pp. van Dijk G. 1985. Vallisneria and its interactions with other species. Aquatics 7(3):6-10. Vandiver VV. 1999. Florida aquatic weed management guide. Univ. of FL, IFAS, Cooperative Extension Service, Publ. SP-55, 130 pp. Verkleij JAC, Pieterse AH, Horneman GJT, Torenbeek M. 1983. A comparative study of the morphology and isoenzyme patterns of Hydrilla verticillata (L.f.) Royle. Aquat. Bot. 17:43-59. This web page was authored in June, 2001, by Victor Ramey (Center for Aquatic and Invasive Plants, University of Florida), with significant contribution from Barbara Peichel (Sea Grant, University of Minnesota). The information contained herein is based on the literature found in the APIRS database. 4. By Stacia A. Hetrick and Ken A. Langeland. 5. By K. Langeland, M. Netherland, and W. Haller.